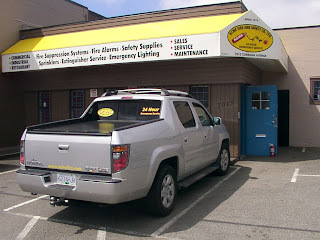 Today we visited Mike Tonolli and his team of fire and safety experts in Burnaby,BC. The whole crew joined in the presentation of the equipment to Werner Sprenger, the Goldenhawk crew chief, in front of their 7015 Curragh Ave. facility. We will install the bottles for the engine compartment and the cockpit and then Acme will run all the lines and do the appropriate tests. Once again this project is blessed to have the best of the best on our team. Mike Tonolli his name be in the drivers pool, so that confirms he not only has caught Salt Fever but now he will get his competition licence in the Goldenhawk at Bonneville, perhaps next season. Saturday at ATB - Watch your fingers!! Saturday Pat Carlson was assisting removing body panels and operating the crane for Kevin Knox and I to pick the car off the trailer. 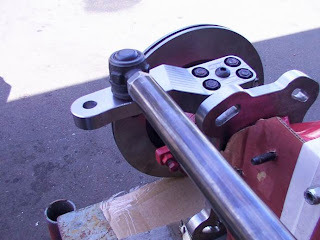 Then he spent his day off making the rear axle mounting system. 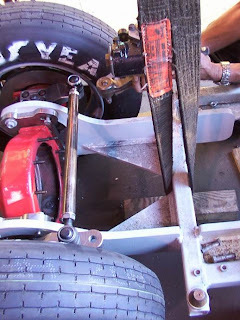 Kevin was making the openings in the front body panels to let the wheels touch the salt. Kevin also was acting paramedic and ambulance driver, after Werner had the misfortune of getting his finger caught in the hydraulics for moving the wheel/body up and down. The good news is nothing is broken but he will have it in a splint for the next six weeks while allowing the torn ligament to reattach itself. Werner is not one to complain and he was back at work as soon as he arrived from the hospital and has been fabricating various mounts and pieces ever since. Werner plays trick on us. 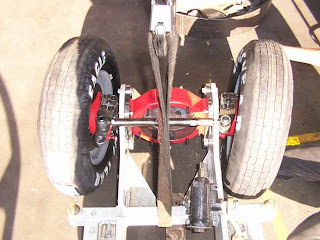 While assembling the chassis after we put the power train in Werner came to me to report that he had discovered an interference problem in the front body mount and tire area. Well, I went quickly to the spot and fearing a major design flaw had reared it's head. However, ABT had been so exact in making the cross members that they can be put in left for right, and as you can see it is a problem. So after a relieved laugh we reversed it and now it points down! Werner is greeted by Aggressive Tube Bending's "Phong" on arrival at ATB. Although he has been helping us with parts preparation this is the first time he has laid his eyes on the body of the streamliner. 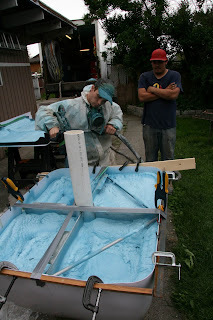 Greer was here, foam is completed on time. 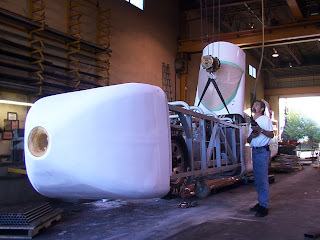 Remember last month we had a requirement for foam insulation in the body of the streamliner? 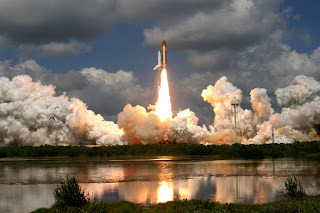 Check back to previous posts and you will see all the photos. Thanks again to Dan Greer and his team, be sure to call them for your spray foam and fireproofing. positioning the Steering box next. 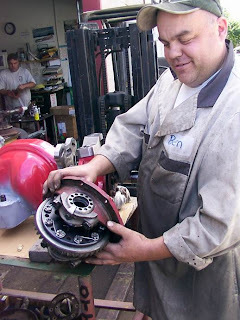 Werner is holding the steering box so that we can determine if the design for the mount will be correct. It is. On to the transmission sheild. Frontdrive final fitting, result good! ...It fits and it will turn left and right , all we have to change is one bolt for a cap screw. What more could we ask for? 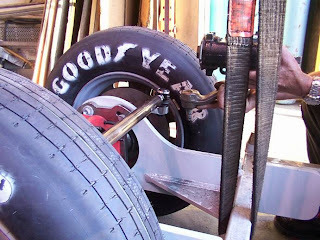 How about more tires??? LONE STAR INDUSTRIES Ltd. steps up to plate. 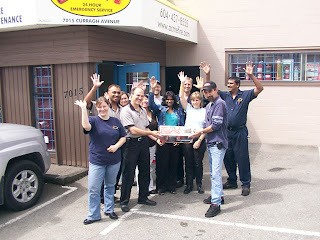 Lone Star Industries Ltd. in Port Kells (Surrey) BC. 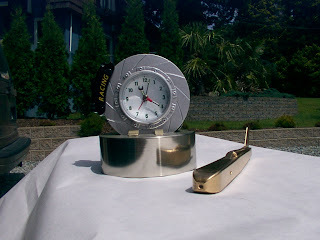 is best and well known for their specialty manufacturing and fabricating in stainless steel, aluminum and steel. Ask any restaurant builder or food processor and they will tell you that Lone Star produces good looking and functional equipment. 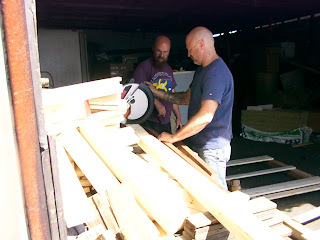 Today we needed a piece of special hardwood and some aluminum pieces and Al Hawes (at the saw) said he had some kind of hard as steel wood, in a moment he sawed a section off for us. Thanks Al, the next time you see it, it will be part of the locating system for the canopy. I belong to the Air Force Association and eagerly look forward to the arrival of Airforce magazine which keeps me informed and entertained. Vic Johnson is the editor of the magazine and is also a former RCAF photographer. Vic has served in many different countries and covered events that he relates to his readers with a kind of style that is informing and yet gives us the feeling that he appreciates the humour in many situations. A native of Langruth, Manitoba, Vic was a couple of photo courses ahead of me in the RCAF and I first met him in the White House (#1 Photo Establishment at Rockcliffe) in 1962. Vic is married to a wonderful woman who always attended functions on the base and never complained about us single guys detaining him to play cards and sip cheap beer once in a while. However, I recall that Vic's sly smile was never an admission of guilt when someone was dripping wet from a prank in the darkroom, but some times we thought he may somehow have been involved. 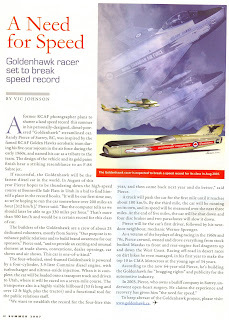 The Carpe GOLDENHAWK Racing team would like to express our thanks for the great article in this issue. See you at Bonneville Salt Flats! Guess what's this, Odds are 1:2 you will. 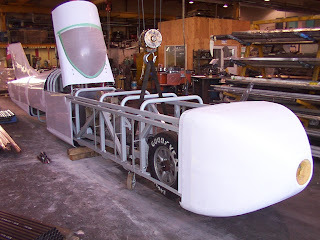 Yes Speed addicts this is the beginning of the Famous, one of a kind double overdrive by OTT Industries of Richmond, BC. (see their link on our sponsor page of the website). 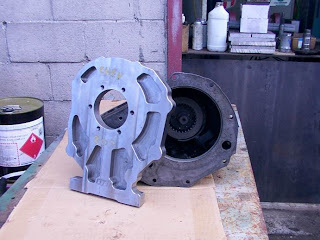 As you can see some of the parts start life in 4X4 ambulance from the early seventies. 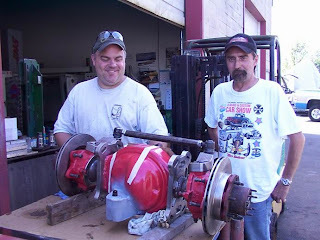 Put 5000 rpm in and get 10,000 rpm out, simple when you have these talented fellows on the task. 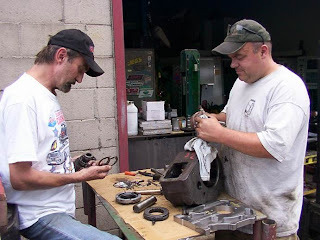 Here you see Werner Sprenger and Ben Olson checking the donor parts before Ben begins the long process of machining the gears to install tapered roller bearing to replace the many needle bearing in the original gear box. This will allow the overdrive to withstand the super high torque out put of the PIERS HARRY race prepared, mega turbo charged Cummins 3.9BT. "It may be a bit of a Curr but this puppy may well open some eyes." Check out what Chris Olson is showing you. 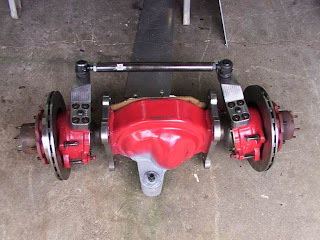 It is the proper way to assemble the differential, lock wired and lock tight'd it is ready for 350mph+. 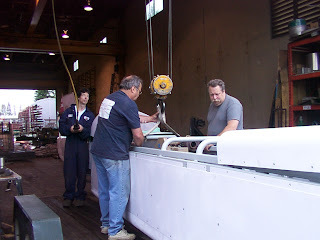 Werner Sprenger, our crew chief and Ben Olson re-check their work before taking it to Werner's shop. It is easy to see they are happy with the results, a job well done! Thanks guys for giving up your Sunday . Sunday noon , July 15 in a secret spot in Richmond,BC. 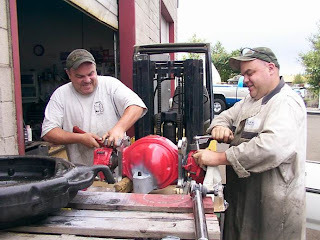 (actually OTT's shop) we find the "Olson twins" Ben (l) and Chris (r) carefully assembling the front drive unit for the LSR steam liner. Note the neat oil sump at the front of the unit. Now can you dig the steering arms? Super heavy duty and machined to perfection. These guys really know how to build a tough piece!!! OTT'S products are made like fine jewelry, so is it any wonder that their sales orders come from customers around the globe? The Hawk has house call from the Doc. 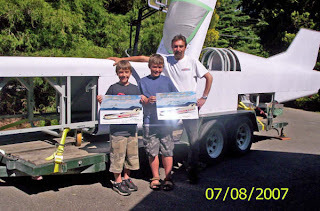 Doctor Glen Dyck and his sons, Mack and Jesse, paid a visit to Werner's house to see the Hawk in progress. 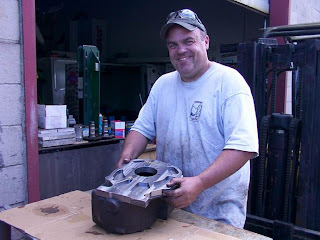 Glen is a real fan of the project and likes to play with his sports cars and motorcycles. The boys got Goldenhawk posters and a tour of the car by Werner however, the Doctor may have caught a serious and uncureable case of salt fever! 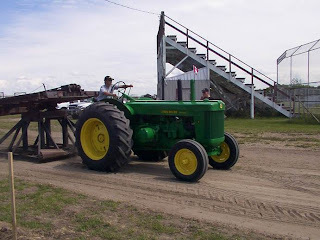 A visit to Souris Manitoba and a classic tractor pull bought me to my roots and the long days spent working for farmers driving John Deere tractors like these. 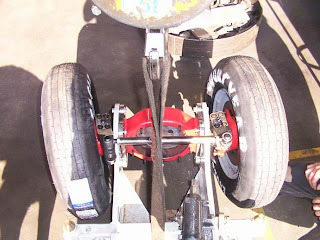 it was great to see and hear the sounds of brute strength with huge torque labouring smoothly with absolute serenity. 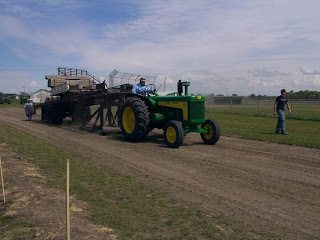 LONG LIVE THE TWO CYLINDER diesel John Deere! It was o7 o7 o7 and just as planned Wendy and I attended a wedding for April Pierce, the eldest daughter of my nephew Bill and his wife Marilyn . 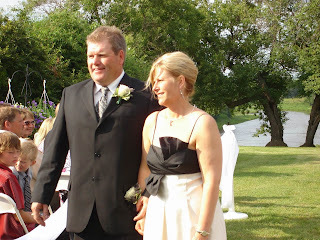 Held in a beautiful setting of a rustic farm retreat on the banks of a river near Souris Manitoba. An evening affair and the Pierce family was all there. 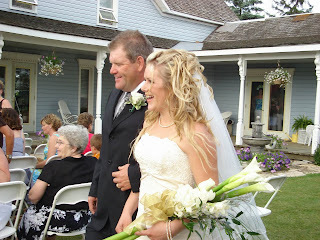 April, the bride, was most beautiful as were all the bridesmaids including her younger sister Katie. A good time was had by all. I wish April, good luck and happiness in her new life as wife and mother. As you can see by the RACING clock the eleventh hour has come and gone and we are pacing the floor waiting for parts and tires. 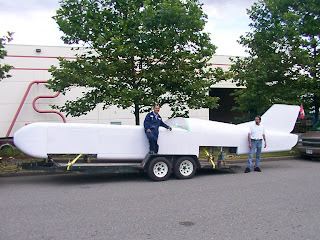 The crew have worked hard to fabricate the chassis and the body, and power train. 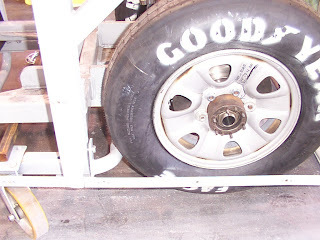 However with tires and some critical parts still to be received we cannot move forward to compete in 4 weeks, therefore, it is with great pride in what we have accomplished and mild disappointment that I must, after much deliberation with the team, POSTPONE the record runs until October. This extra time will give us the opportunity to test parts on the dyno and develop , the new 3.9 Cummins turbo diesel engine by Piers Harry. The World Finals at Bonneville start on October 3, 2007 and we will attend to do what we intend to do, SET THE E/DS record at 225+ mph. Thanks to all the sponsors and volunteers who have made this possible. 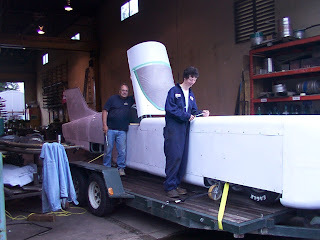 By now all you folks know that Kevin Knox owns a company called DIVERSIONS ............(http://www.kevinknox.com/) and sponsored and built the body at Plastec. And you most likely know that he is very talented and possesses every high tech toy in his grasp. 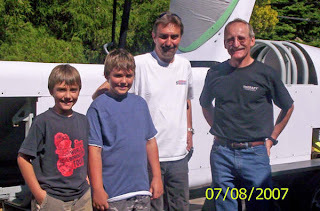 You will also remember that he did the 3D engineering drawings for the build of the Goldenhawk. Well here is the first solid plastic absolute to scale model, which he made on his (FDM?) rapid prototyper (3D printer). Notice that it has a Sabre jet type tail on it to see what it would look like. However we chose to stay with the original tail for a couple of reasons. 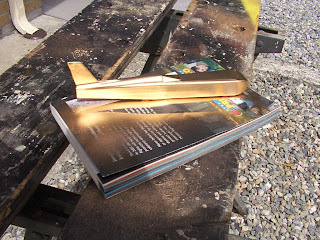 Today I sprayed it gold, although it is not sanded prior to paint it still looks good. Watch for the larger model with full decals to be available for the collectors and fans. The final models will be cast in metal and also in plastic. Prices will be reasonable.